You think that's a lot of stuff in the headline, you should have seen my original. eBay is offering this new 8GB Android 4.0 Capacitive Screen Tablet for $76, and tossing in FREE shipping to boot. This retails for over $250. So for that price get a 7-inch tablet running the latest android operating system with all the fixings. I checked and it's gotten good ratings. I mean, it's no iPad, but for that price it does everything you need and then some. 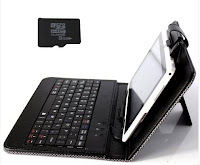 You'll also get an additional keyboard case cozy and a 8G TF Card to hold additional storage.